← Stanley Wells’ Shakespeare & Co.
For this week’s post, I thought I would write about technology and the 17th century, specially the microscope. Allow me to make a generalization about our own culture: we are technophiles! We consume technology almost without after-thought. 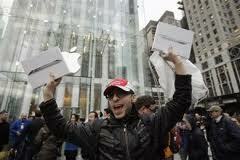 Lines wrap around Apple stores when Steve Jobs launches a slightly upgraded version of the I-Pad, I-Phone, or I-Pod. Yay, I spent nearly a whole pay check on an I-Pad! But now I can fill that gaping hole in my life with something shiny! One of my favorite writing assignments to give my Comp I students is to have them identify and argue for an unintended consequence of a recent piece of technology. (I love to watch my students’ confusion when I define for them the word, luddite – the very concept that someone could be against technological advancement is so unrealizable for them.) A rather thought-provoking essay that I have my students read is Nicolas G. Carr’s “Is Google Making Us Stupid?”. Carr’s main argument is that with every technological advancement in the dissemination of information – writing (Carr cites Plato’s Phaedrus), Guttenberg’s printing press, the type writer, and the internet(s) – the way we think actually changes. One of Carr’s points that I stress for my students is that technology is not simply tool through which express ourselves but alters our very thought processes. I bring this point up because it is fascinating to see the concerns that pieces of technology, which seem so innocuous to us, provoked for peoples who were experiencing them for the first time. Consider the microscope, probably the quintessential piece of technology of the Scientific Revolution. Developed by two Dutch eye glass makers, Zaccaharias and Hans Janssens, the microscope was popularized in England by Robert Hooke. (You might remember him from your middle school biology classes for being the first who look at a slice of cork and notice the “cells” that composed it.) In 1665, Hooke published an account/promotion of his work with the microscope, entitled Micrographia. Hooke prefaces the work by arguing that the microscope is actually going to help humanity to regain the knowledge of nature that Adam possessed before being expelled from the Garden of Eden. As Hooke claims, humanity’s sense are in an imperfect state to what they use to be prior to the Fall and it is only through technology that they can be restored to their original condition: “The first thing to be undertaken in this weighty work, is a watchfulness over the failing and an inlargement of the dominion, of the Senses. . . The next care to be taken, in respect of the Senses, is supplying of their infirmities with Instruments, and as it were, the adding of artificial Organs to the natural. . .” In other words, the microscope was not meant to so much for advancement but rather restoration. Yet not all accepted Hooke’s argument for the restorative potential of the microscope. 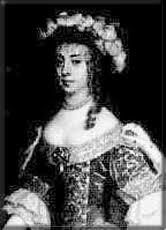 Particularly, Margaret Cavendish, the duchess of Newcastle, expressed serious epistemological reservations about the microscope. ". . . though I cannot be Henry the Fifth, or Charles the Second, yet I endeavor to be Margaret the First"
First off, who was Margaret Cavendish: a lady-in-waiting to Charles I’s wife, Henrietta Maria, Cavendish went into exile in Belgium and France during the English Civil War and the Cromwellian regime. She returned to England in 1660 with the restoration of Charles II. Now the intellectual atmosphere of London was full of talk of the new science: university clubs devoted to experimental philosophy were very popular. 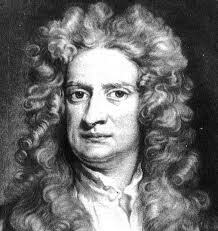 In 1662, Charles II granted the charter for what would become the preeminent scientific association, the Royal Society. Margaret was incredibly aware of the scientific/ intellectual conversations of her day: she knew René Descartes and Thomas Hobbes personally, as well as being the first woman invited to visit the Royal Society on May 23, 1667. An excellent study of Margaret Cavendish’s life and thought is Anna Battigelli’s Margaret Cavendish and the Exiles of the Mind (1998). 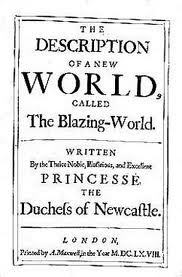 Cavendish’s most well-known work is The Description of a New World, Called the Blazing World (1666), a allegorical tale in which the protagonist, the Lady, is transported to fantastical world of which she becomes Empress. While Margaret Cavendish’s criticism of something that has become so fundamental to the practice of the sciences, perhaps she still may speak to how much our understanding of reality is created mechanically rather than imaginatively.